What is Antilock Braking System or ABS in cars? Antilock Braking System (ABS) is a type of an active safety system of a vehicle. It is also known as the anti-skid braking system. This system comes into action when the driver suddenly applies the brakes during an emergency. Employing the antilock braking system on cars and bikes is now mandatory in most parts of the world. Whenever the driver suddenly applies the brakes to a high-speed vehicle, there is always a chance of the 'wheel-lock'. The wheel-lock means that the respective wheel stops suddenly instead of coming to a halt slowly. Due to the wheel-lock, the driver loses control over the vehicle and the vehicle skids off the road. Thus, a fatal accident takes place. In order to avoid such situations, the manufacturers employ the ABS system. Wheel speed sensors continuously monitor the speed of each wheel. As long as all the wheels have comparable speed, the system does not interfere with their operation. However, if the speed sensors find that the speed of any of the wheels is reducing drastically, then it means that the particular wheel is going to lock. However, the locked wheel hampers vehicle stability. Thus, the vehicle stops responding to the steering input given by the driver. At this moment, the vehicle also starts to skid; thereby causing a fatal accident. To avoid such a mishap, the ABS comes into action. 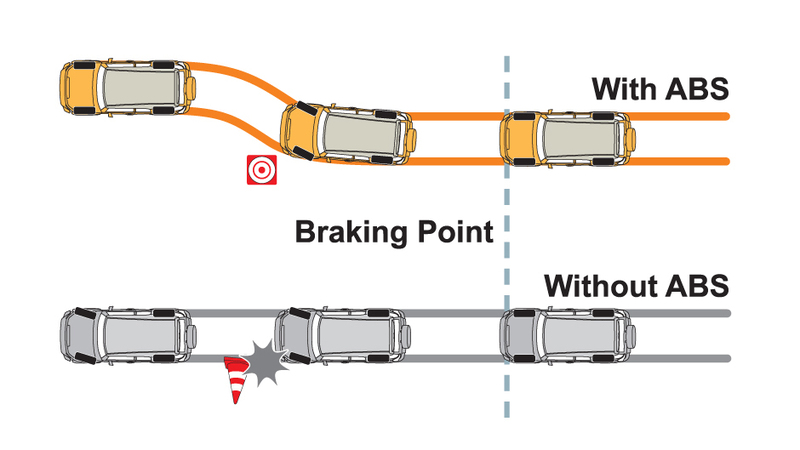 How does the Antilock Braking System work? 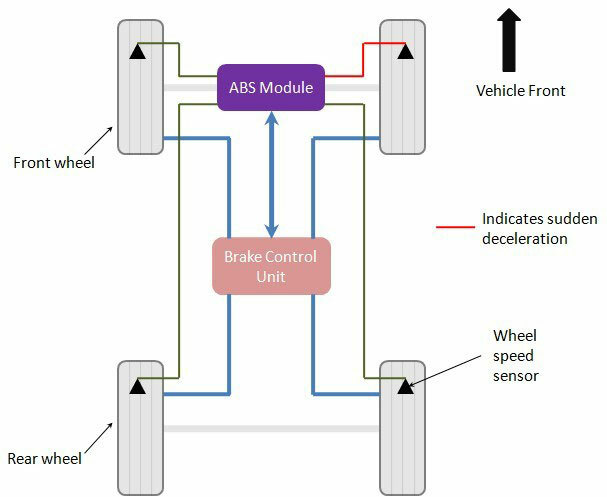 After receiving the signal of very low speed from the wheel speed sensor, ABS module orders the brake control unit to reduce the braking force of that wheel. Reducing the braking force means reducing the hydraulic pressure in the brake line acting on that wheel. The Brake Control Unit reduces the line pressure with the help of valves in the system. When the braking force reduces, the wheel starts rotating at a higher speed; thereby avoiding the wheel-lock. As the wheel doesn't lock, steerability of the vehicle remains intact which means that the vehicle moves according to the driver's input without skidding. Once the normal condition is restored, the Brake Control Unit restores the hydraulic pressure in the brake line with the help of a pump. 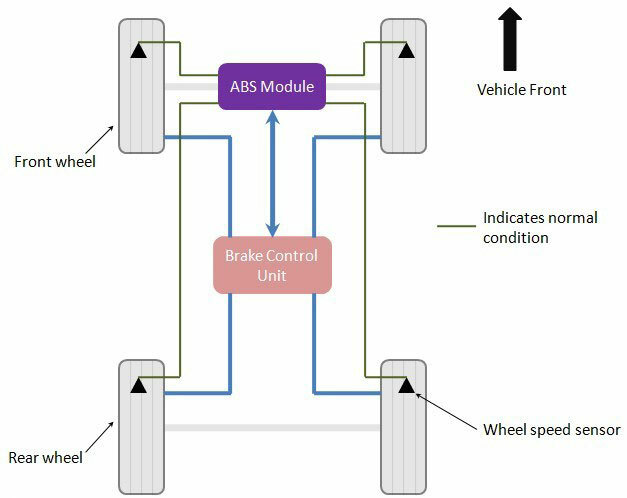 ABS maintains the vehicle steerability and stability during panic braking. It reduces the braking distance by up to 10% or more, especially on wet surfaces. Perhaps the only disadvantage of the Antilock Braking System is its higher cost. At present, purchasing the Antilock Braking System installed bike or car costs significantly to the customer. However, this higher cost is completely offset by the improved safety this system provides. Also, the auto industry is working on developing a low-cost version of the antilock braking system. 2 Three channel-four sensor ABS (i) A separate sensor for each wheel. (ii) Separate valves for front wheels. (iii) Rear wheels controlled by only one valve. 3 Three channel- three sensor ABS (i) A valve and a sensor each for front wheels. (ii) One valve and one sensor for rear wheels. Depending on the severity of the braking condition, the driver may feel pulsations in the brake pedal when the antilock braking system starts working. This is absolutely normal and care is to be taken not to release the brake pedal during this phase as it will prevent the system from working properly. Motorcycle ABS is a small-scale version of a car ABS. However, the working of motorcycle ABS is exactly similar to that of full-scale car ABS. It requires less number of valves and wheel speed sensors due to the presence of only two wheels. According to Bosch, using motorcycle ABS increases the stability of the bike and improves riding comfort. The company has also proved that the braking distance reduces considerably when the bike uses the antilock braking system. 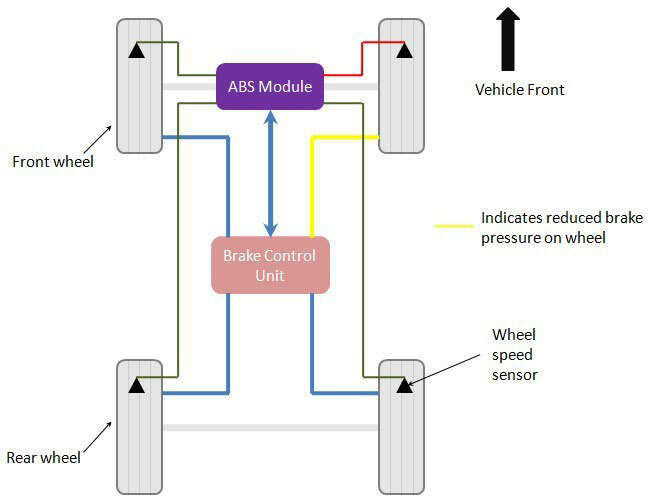 Home » Technical Anatomy » What is Antilock Braking System or ABS in cars? What Are The Driving Modes & How Do They Work?